1) How did you choose the genre you write in? - I don't really choose to write based on genre - I write based on the story I want to tell. I read mostly YA, so it was natural that I gravitated toward that. 2) The use of mythology in your book was a terrific idea, have you always liked mythology or was it more of a recent interest? - Thank you! I've loved mythology since I was a kid, and my interest in it over the years has only grown. 3) What was your favorite scene to write and why? - My favorite scene to write actually takes place at the end of the second book, but as for The Goddess Test specifically, I'd have to say the council scene for sure. 4) Who was your favorite secondary character to write about and why? - It's a tie between Ava and James. I love them both for different reasons, and they each brought something unique to their scenes. 5) Do you ever base your characters off of you or people you know in real life? - Never. The characters serve the story, and if I tried to insert a real person into the story, it wouldn't feel right. 6) Did you get to choose the book cover? It's lovely! - Thank you again! I didn't get to choose, but my editor did involve me in the process a little, keeping me up to date on what was going on and listening to my input. 8) How did you choose the titles? - The working title of the first was just Persephone, but of course that didn't fit, and my father and I had a brainstorming session. To this day I'm not entirely sure who came up with The Goddess Test, but he was the one who championed it. I didn't like it too much to start off with, but it definitely grew on me. 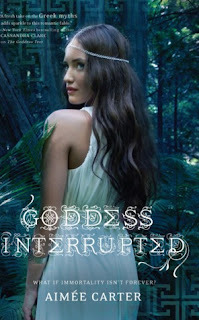 As for Goddess Interrupted, my working title for that was Goddess of the Underworld, but that was a little too blah for the story, so my editor was the one who suggested GI. The third book, The Goddess Inheritance, was more of an interesting story - I did have a working title for that, but it's a little too spoilery to mention it. My editor wasn't crazy about it, so I came up with a huge list of options, and she chose from there. 9) Is there any author(s) who had a large influence on you? - I've reread my favorite authors again and again and again, and I'm sure somewhere along the way my own writing was influenced by theirs. JK Rowling, Orson Scott Card, Suzanne Collins, Anne Bishop, David and Leigh Eddings, etc. 10) When and how did you decide that writing was perfect for you? - I never really decided - it just happened to be the thing that I did well, and I loved storytelling. It started out as a hobby, and it grew from there. I learned as much as I could, I read as much as I could, and I wrote as much as I could, and it stuck. Chocolate or vanilla (there's a right answer to this one)? - Chocolate. Seaside or Mountaintops? - Mountaintops. I'm not much of a beach person. Ancient Greece or Ancient Rome? - I love Ancient Greek mythology, but I love the culture of Ancient Rome as well, and I find it fascinating. Favorite color? - I don't actually have a favorite color, but I tend to gravitate toward deep jewel tones. Who is ready for this amazing book? I can't wait, thank you very much for stopping by Aimee! I LOOOOVED your book!! Thank you so much for being a writer and I can't wait for part 2!!!! OMG GODDESS TEST WAS SO GOOD! its one of my favorites. I cant wait for the second book to come out, I really really love how Aimee writes.